„The Expedition 55 crew is ramping up for Thursday’s spacewalk and training for next week’s arrival of the SpaceX Dragon resupply ship. Just four days after moving into their new home NASA astronauts Ricky Arnold and Drew Feustel are getting their suits and gear ready for a spacewalk on Thursday. The duo filled spacesuit tanks and cooling garments with water and reviewed checklists and warning systems today. They will work outside for about 6.5 hours to install communications antennas on the Tranquility module. The pair will also replace a camera assembly on the Port 1 truss structure. Arnold and Feustel are expected to set their spacesuits to battery power at 8:10 a.m. signifying the official start of Thursday’s spacewalk. 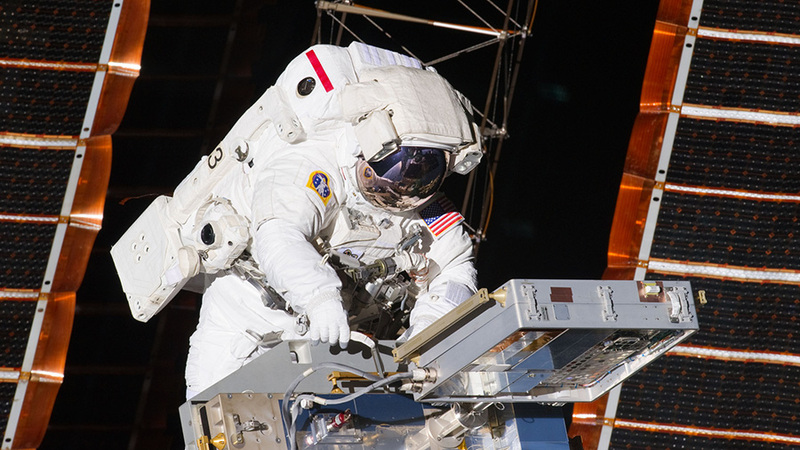 NASA TV will begin its live coverage of the spacewalk at 6:30 a.m. ET. Meanwhile, Flight Engineers Norishige Kanai and Scott Tingle continue training for next week’s capture of the Dragon cargo craft with the Canadarm2 robotic arm. Kanai will be at the robotics controls inside the cupola as Tingle monitors Dragon’s approach and rendezvous.